My husband and I chose our Bosch washer and dryer very carefully. We had a 3 year old and a newborn at the time and planned to use cloth diapers. We needed something that was very energy and water efficient to handle the large volume of laundry we would be doing. Additionally we needed something that cleaned very thoroughly considering the fact that we would be washing dirty diapers. We looked high and low before settling on the Bosch Axxis washer and dryer. This washer has a very high Energy Star rating. It also uses very minimal water in its wash cycles. Another great feature is that it heats its own water, a God send for a family with an oil hot water heater! Another attractive feature of this washer and the corresponding clothes dryer is the size and ability to be stored in a very compact way. This washer came with a stacking kit so that you could stack the washer and dryer if you were short on space. Even side by side these machines are tiny in comparison with much of what is on the market. Now let's talk cleaning power. This is one awesome machine! There are many options for extra rinses, spinning speed, and even temperature adjustment. It is very hard to wash something in this machine and have a stain not come out. It is truly amazing. I was always very happy with the results on those aforementioned cloth diapers and a still happy now that my kids are out of diapers and on to grass and ketchup stains. 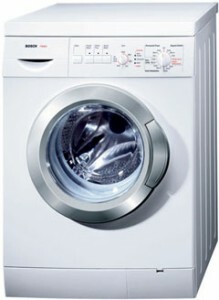 This is a really great washing machine, I cannot recommend it enough!